I JUST closed the book. I'm blogging directly (other than the time it took for me to go back and read a few choice passages). I won't spoil the book by giving away the ending. Suffice it to say - it was good. Our "young" bookclub read Rebecca (1938) one month which is was my first and only exposure to du Maurier to date. It's labeled a "mystery romance" as is Rachel. Rebecca was picked up and produced by none other than Alfred Hitchcock and if you have yet to see it, I heartily recommend it. Upon finishing My Cousin Rachel I discovered that it too was made into a movie staring the beautiful Olivia de Havilland (in 1952) which I am now incredibly curious to see. I also just discovered that Hitchcock's The Birds was also based on a short story by du Maurier. If you like Hitchcock, you'll like du Maurier and vice versa. I think they suited each other very well, being similar story tellers. Quite a pair, those two. There is the same ease in story telling that keeps you on the edge of your seat to find out what is going to happen but doesn't startle you to the point of fear. Daphne du Maurier is the type of suspense I can handle. It's predictable in some respects, which removes the fear aspect. Yet at the same time, she drags her readers along, ending each chapter in cliff hanger type fashion, compelling you to forget the laundry, the correspondence, dinner and the children who are clamoring for attention. You just. have. to. keep. reading.! My Cousin Rachel was not disappointing in the least. I still love du Maurier's style just as much as I did after reading Rebecca so many years ago. I've had House on the Strand sitting on a bookshelf staring at me for almost two years now and I can't think of why I've waited so long to get to it. If you like suspense without the anxiety, du Maurier is definitely your style. She makes you feel for the characters - and like them even though you don't trust them - and without much of an explanation, leaves you with her conclusion on the matter in a way that makes you feel satisfied without the gore. Which is exactly why I like Hitchcock so much. It has 1940's and 50's glamour and charm without the modern flair for indiscreet immorality and violence. It is pure entertainment in the sense that du Maurier is very engaging. I read this book for my local bookclub's reading assignment for the month and I'm so glad I did. It's fun and fantastic without being disturbing. If you like suspense but don't like sorting through the mud and the muck of modern day mystery/thriller writers, give du Maurier a try. I think you just might like her. She has at least one other she's authored, Jamacian Inn. It too is suspensful. Quite good! Great review. 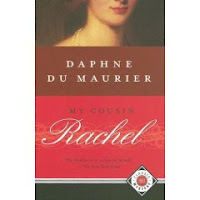 I LOVED My Cousin Rachel, if only because it kept twisting and turning and playing games with me. Du Maurier was a first-class writer, but she often gets too short of a shrift because she wrote in the mystery/suspense genre. The King's General is also good. Ah, yes. The church book club. Very good times indeed. Rebecca is one great novel. I have read few of short story collections. Very very good. I have not read this. I will! I read Rebecca for book club and loved it. That was a few years ago and I think it's time to pick up another duMaurier book. Thanks! I loved Rebecca but haven't read anything else by Du Maurier. Thanks for the recommendation! Du Maurier is one of my favorite creepy authoresses, she knows exactly how to play with the mind while not being overly graphic, like Alfred Hitchcock. The only modern director that I feel comes close to this psychological creep out is M Night Shyamalan in Signs and The Village and Sixth Sense. I just finished a compilation of her short stories in a book called The Breaking Point. Talk about SPOOKY! Ah-hah! I found your post. :) I loved this book. I really enjoyed Rebecca too when I read it years ago. RE: movies PBS remade Rebecca, which wasn't half bad, though I'll always love the 1940 Hitchcock vs. best. As for My Cousin Rachel -- I can't seem to locate it on DVD/VHS. I don't think it's available, except rarely shown on cable. Interesting tid-bit... Olivia de Haviland(sister of Joan Fontain) plays in MCR and Joan played the second Mrs. DeWinter in Rebecca. Cool, huh? PS - Besides Jamacian Inn there is also The Kings General, and Frenchman's Creek too name a couple more, but I've not read them. I think "The Birds" was a shor story by her too.